LA PAZ – The ancestral knowledge of the Aymara, Quechua and Guarani Indians forms part of the curriculum of Bolivia’s first three indigenous universities, whose inaugural class includes 480 students from rural communities. Studies in oil and natural gas, highland and tropical agronomy, veterinary and zoo-technical science, the textile industry and aquaculture are some of the 12 degree programs offered at these new institutions of higher learning promoted by the government of socialist President Evo Morales, Bolivia’s first indigenous head of state. But the universities are striving to do more than promote an appreciation for the knowledge of the country’s main indigenous communities; the goal instead is for students to apply that knowledge to practical projects in rural areas as part of their advanced studies. One of the universities, an Aymara establishment named Tupac Katari in honor of an Indian leader who led an 18th century rebellion against Spanish colonial rule, is located in a building in the town of Warisata – about 100 kilometers (62 miles) from La Paz – that in 1931 became the first indigenous school in the Bolivian altiplano (high plain). More than 160 students at Tupac Katari live on campus from Monday to Friday, while 320 other students are enrolled at the other two indigenous universities: Casimiro Huanca, a Quechua institution in the central province of Cochabamba; and Apiaguaiki, a Guarani university in the southern province of Chuquisaca. Edgar Mamani, 26, arrived in Warisata from a rural community 600 kilometers away – having been selected from among a group of young people there – but said he plans to return home and apply all the knowledge he has acquired. But rather than studying law, architecture or medicine, Mamani said he will specialize in food engineering because that will better prepare him to give back to his region. “I’ve always wanted to go to university and I’d always thought about something that had to do with the countryside. I can’t leave my region, and this university has a vision of productivity that is necessary for the changes Bolivia is experiencing,” the student, wearing a typical Andean wool cap, told Efe. 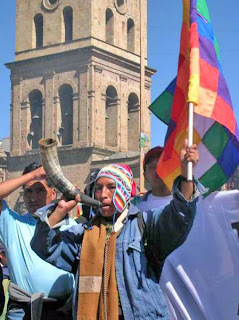 Celso Anaya, 25, attends his Aymara Agronomy class each day wearing a scarf featuring the colors of the Whipala indigenous flag, which after the approval of Bolivia’s new constitution – aimed at empowering the Indian majority and narrowing the 90-1 gap in wealth between the richest and poorest sectors of the population – became a national symbol. Anaya told Efe he chose Tupac Katari for its “basic, philosophical principles,” and because he will be surrounded by his native culture while pursuing his university studies. The rector of Tupac Katari, Benecio Quispe, an Aymara Indian from the southwestern province of Oruro, said the university is part of President Morales’ “decolonization” goals. “One might think this university was founded so Indians can keep being Indians, but no. It’s not about creating ethnocentric universities, universities that turn Indians into a type of walking museum,” Quispe said. Instead, educational authorities want to train top-notch professionals in every field, and to do that they have devised courses of study that combine the recovery of Indians’ language and culture with the study of Spanish and English. The objective of the indigenous universities is for students to return to their communities once their studies are complete and apply the traditional knowledge they acquire to improve the productivity of their region. For that reason, half of study time is devoted to practical matters, with students tasked with creating a project applicable to their home community. Students at Tupac Katari – like at any other university – also take time for recreation activities such as playing traditional Aymara instruments or dancing to Huayño folk music before lunch hour.